River Drina is 346 km long and is formed when rivers Tara and Piva merge into it at Šćepan Polje in Montenegro. It flows through Montenegro, Bosnia and Herzegovina and Serbia. The Drina is the largest tributary of the river Sava and it flows into it in near Sremska Rača. The Drina’s course through Serbia is 220 km long. The wild power of the Drina was tamed by dams and lakes (Višegradsko, Perućac, Zvorničko lakes) what has affected, but not destroyed the beauty of Drina’s canyons. Three hydroelectric plants were built on the Drina: Višegrad, Bajina Bašta, and Zvornik. Drina Kayak – Adventure 2 – experience an unforgettable water adventure, see a beautiful waterfall at the river Vrelo, feel the freshness of the Drina in warm summer days while passing through the rapids turn your head to take a look at the forests, or simply relax enjoying the unusual colors of the river Drina. The Drina is suitable for all ages and with no previous experience in kayaking since it belongs to the 1st and 2nd class according to the river difficulty. Before entering the water, we are familiarized with the equipment and the safest ways to use it, with situations that we could encounter while kayaking and how to handle them. 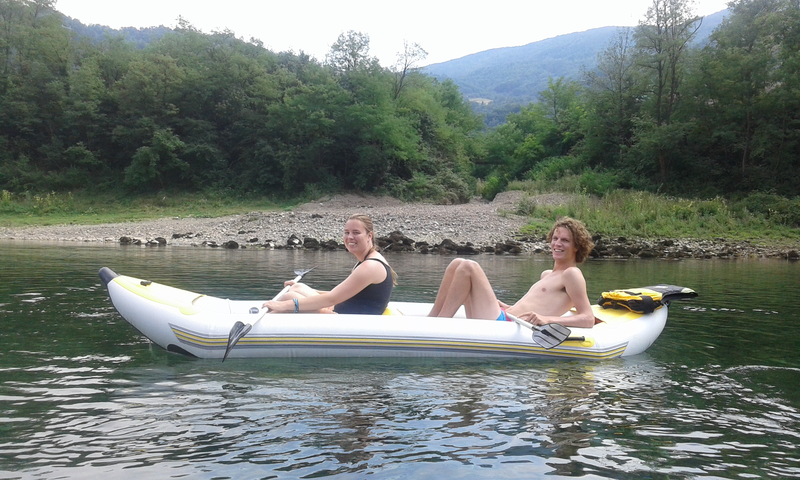 Drina Kayak – Adventure 2 is organized on the stretch Perućac – Rogačica. 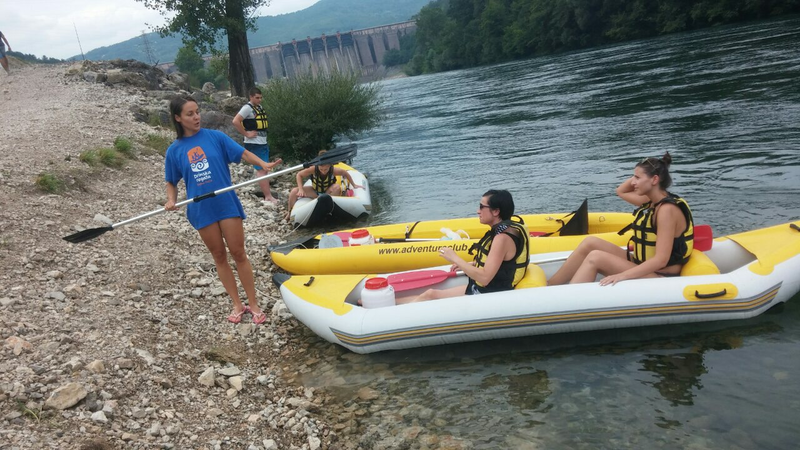 The tour starts on the plateau below the HE “Bajina Bašta”, where we prepare the equipment, get the basic instructions from our guide and slowly start down the river. In the beginning, we visit the waterfall of the river Vrelo, where we take photos and slowly continue downstream. 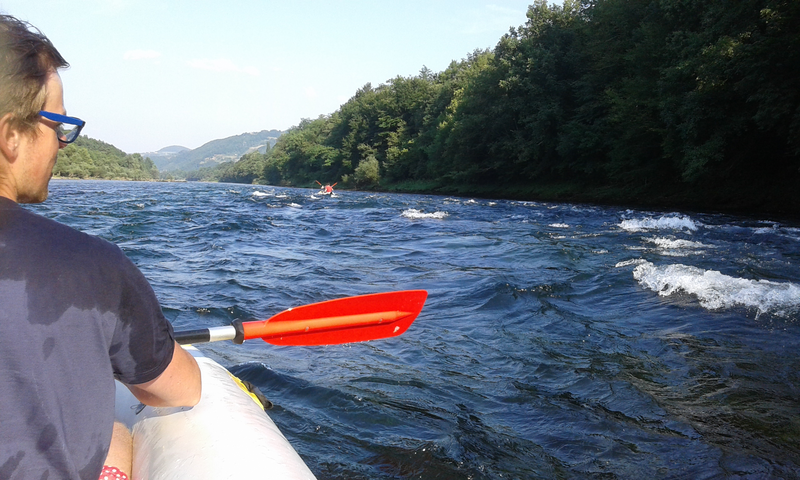 We enter the rapids called “Red waters”, 3 km after the start, where we feel the strength of the river Drina for the first time. On the 13th km, we make a break on the city beach. We can swim, use the toilet, have some drinks and then continue all the way to the famous “House on the rock”. We continue our journey to the confluence of the river Rogačica into river Drina, with breaks to take photos and swim. 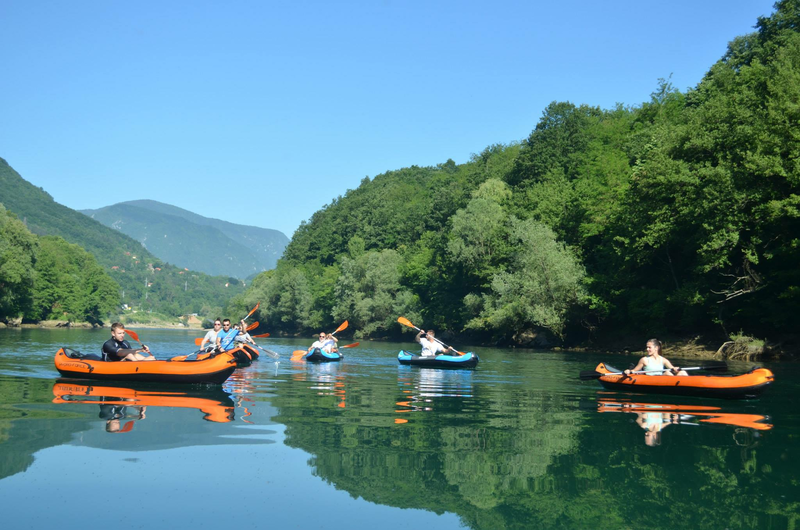 Drina kayak – Adventure – are available every day in the week during the summer season. All you need to do is contact us and reserve your place on the boat. Safety: All adventures are guided, so besides the professional equipment, a professional guide is in responsible for the safety of all the participants of kayak adventures. Food: You have to provide food for yourself. We recommend that you take with you: food for the whole day, some sweets, at least 1 L of water, juice. Alcohol is not allowed during the Adventure activities. In agreement with participants, we could provide the food during the tour and accommodation in our new apartments. The final deadline for cancellation is one day before departure. © 2019. Trendy Travel. All rights reserved.